Children at Hollins Grundy are expected to wear their school uniform to school. A uniform instils a feeling of pride and belonging in children and signals to them that there are different expectations made of them during school time than would perhaps be the case if they were at home or playing out. A uniform also ensures that children are free from the pressures of conforming to the latest trends and the worry associated with not being able to afford the latest trainers or other accessories. In the summer red & white gingham dresses may be worn. 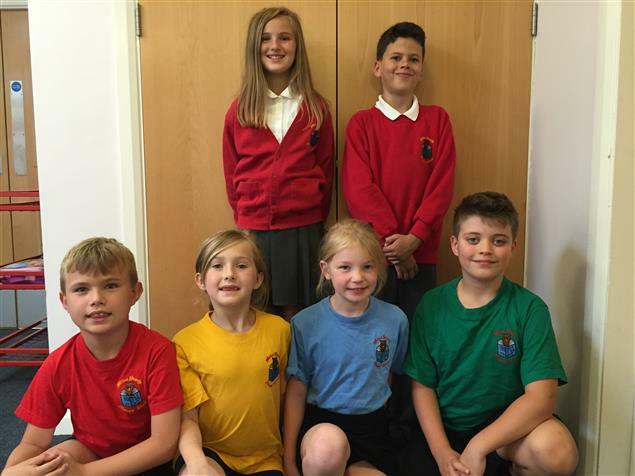 These items are available from the school office but it is perfectly acceptable for children to wear plain items with no logo from other shops as long as they are the correct colour. Children should have the correct PE kit for every PE lesson. In colder weather children may wear plain blue, black or grey sweatpants and tops over their PE kit when doing games outside and wear appropriate outdoor trainers. In general primary age children have no need to wear jewellery other than a watch which will help them to learn to tell the time. Some children however do have their ears pierced and in this case earrings should be small studs which children can remove and replace independently for PE lessons. Where earrings cannot be removed children must cover their ears with plasters during PE lessons. For safety reasons, and to protect potentially valuable items no other forms of jewellery (such as rings, necklaces, bracelets, false nails, very large, ornate headbands) should be worn during school time. There may be times when parents feel that for cultural or religious reasons we should make exceptions to these rules. If so, requests should be made in writing to Mr Waddington.